Mimi Kennedy Mimi Kennedy is a U.S. actress and activist. Mimi Kennedy was one of 100 "prominent Americans" who signed an October 26 2004 statementcirculated by 911Truth.org calling on the U.S. Government to investigate 9/11 as a possible "inside job". Teamwork 2006. :-) — with Carrie Darrow Honigman, Marcy Winograd, Cindy Sheehan, Stephen Shaff, Tim Carpenter, Mimi Kennedy, Jodie Evans and Kevin Spidel at SoCal. The week leading up to the anti-war demonstration at Olympic and Broadway in Los Angeles on Sept. 29, 2007 which included a tent city to “Occupy the Occupiers,” was historic in many ways. When the idea was first introduced by members of the Troops Out Now Coalition-L.A., a group that was formed to build for the September actions in Los Angeles. Organizations led workshops that included the history of struggles in the Philippines by BAYAN USA and in El Salvador by the FMLN. Life in present-day Cuba and the struggle to free the Cuban Five was presented by FIST (Fight Imperialism, Stand Together) along with the Coalition in Solidarity with Cuba and the American Friends Service Committee. U.S. Labor Against the War organized a discussion on the trade union movement. The Garment Workers Center led a discussion on labor rights and immigration. A very exciting multimedia presentation was done by members of the March 25th Coalition, Students for a Democratic Society and Latinos Against the War on Venezuela and Colombia that included the immigrant rights struggle. Workers World Party held a teach-in on building unity to stop the war, using the book “Bolsheviks and War” by Sam Marcy. Presenters at the Encampment included Ron Kovic, author of “Born on the Fourth of July”; Eisha Mason of AFSC; Namibia Donadio of FIST; Don Bustany of Pacifica Radio’s Middle East in Focus; Carol Frances Likins of the Coalition in Solidarity with Cuba; Andy Griggs and Tom McKenzie of USLAW; Carlos Montes of Latinos Against the War; Martha Rojas of the March 25th Coalition; Eric Gardner of Students for a Democratic Society and the Freedom Road Socialist Organization/FightBack! ; Berny Motto of the FMLN; Mazen Almoukdad, member of Al-Awda; Terrie Cervas, Bev Tang and Apollo Victoria of BAYAN USA; and Larry Hales of Workers World Party and FIST. At the demonstration on the 29th, Palestine was a prominent focus. Mahmud Ahmad, representing Al-Awda Los Angeles, was one of the first speakers at the main rally who made the connection between U.S. wars of aggression and their unbreakable link to the struggle in Palestine. Speakers at the main rally included actor Mimi Kennedy; Fernando Suarez del Solar of Military Families Speak Out; Hamid Kahn of South Asian Network; Omar Jubran of CAIR; Jasimen Syler of United Liberation Army; Cheryl LaBash of U.S./Cuba Labor Exchange; Andy Griggs of USLAW; Deanna Taylor, national co-chair Peace Action Committee—Green Party USA; Gloria Verdieu of San Diego International Action Center; Eric Gardner of UCLA SDS; Carlos Montes of Latinos Against the War; Hwa Young Lee of Korea Truth Commission; and Terrie Cervas of BAYAN USA, who gave a rousing speech about the significance of the week’s events. 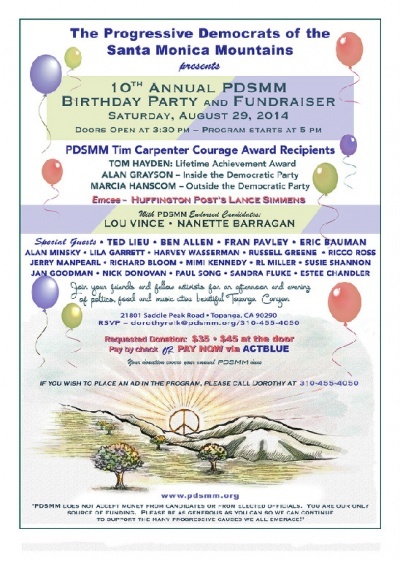 Mimi Kennedy chairs the Advisory Board of Progressive Democrats of America.